Gus Van Sant (Good Will Hunting) brings us Don’t Worry, He Won’t Get Far on Foot a Dramedy that tells the life of John Callahan and the rocky path to sobriety after a life changing accident. 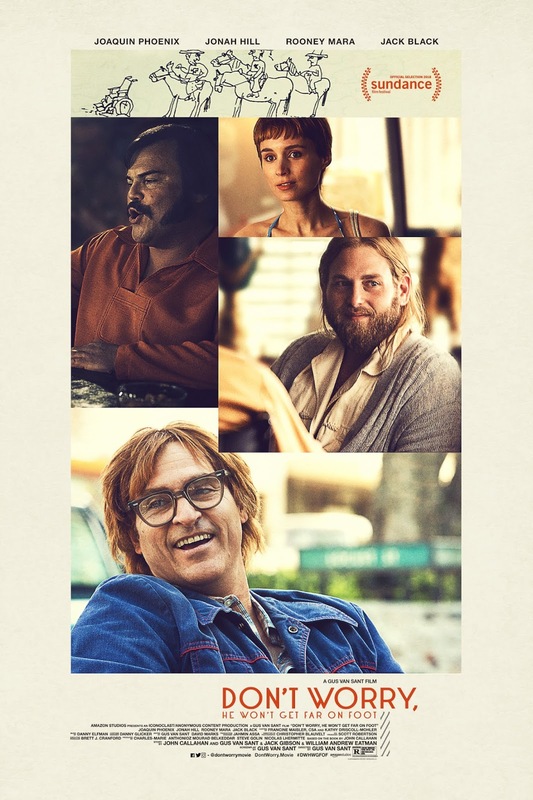 John Callahan is played by Joaquin Phoenix who once again transforms into a role and leaves the audience not seeing the actor but the actual person he is portraying. Rooney Mara and Jack Black also show up in the film for more of a glorified cameo per say. That doesn’t mean they don’t bring their A game. Mara turns in a wonderful performance that engrosses us into her sweet character, and Jack Black leaves me wondering when he will tackle more dramatic material, he is fantastic in one scene towards the end of the film. The big scene stealer for the whole entire film though that warrants any film buff into seeing this movie though has to be Jonah Hill, the guy not only steals the movie from the great Phoenix, but hands down gives the best performance of his career. This guy can only go up from here. Who knew we would be praising Jonah Hill in this film out of all of the cast members, I never thought so. Gus Van Sant though directs this film and I have to say as he does a unique job with directing and some of the visual and editing tools they decided to throw in were a nice addition this is where the film at times fell flat for me. Part of this movie I loved and parts I was just tolerating due to the great performances the actors were giving. The Films story structure can feel very disjointed and as looking back on the film I can see a reason to do this is due to the fact Callahan’s life was very disjointed and it's a unique way to tell the story I never thought it paid off in the right manner. Definitely not the worst way I’ve seen this done, but certainly not the best. Overall I still think Gus Van Sant did a good job directing and wrote a wonderful script that had some fantastic dialogue, he took a risk in the story telling that worked in some scenes and other times didn’t.. I enjoyed about 85 percent of this film and the other 15 percent I got through and survived. Usually that would hurt a film a lot, but since Don’t Worry, He won’t Get Far on Foot carries some of the best performances of the year it's hard to not recommend the film for those alone. For more views on the film check out my video review of the film down below and feel free to leave a comment so we can discuss the film in detail.